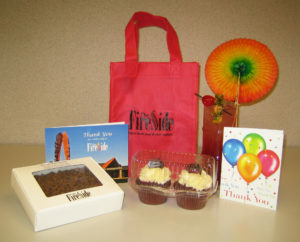 The Fireside’s Celebration Package is perfect for guest celebrating a birthday, anniversary or other special event. The package includes a two-pack of Red Velvet Cupcakes with Cream Cheese Frosting and a 14-ounce package of delicious Pecan Treasures from our Bakery in a re-usable Fireside tote bag along with a souvenir photograph and two glasses of our Celebration Punch – a celebratory mix of fresh tropical fruit juices, pineapple rum, and a splash of white soda – available with or without alcohol. You may also have your special occasion announced in the theatre with the opening welcome if you wish per the following guidelines – we announce all Wedding Anniversaries and Birthdays for ages 18 or less and 50 or more. This $20.00 package is available through the box office in advance of your visit by calling 1-800-477-9505. If you do not wish to purchase the Celebration Package but would like a birthday or anniversary recognized please let the box office know and they will arrange to have a candle in the dessert as it is brought to the table.